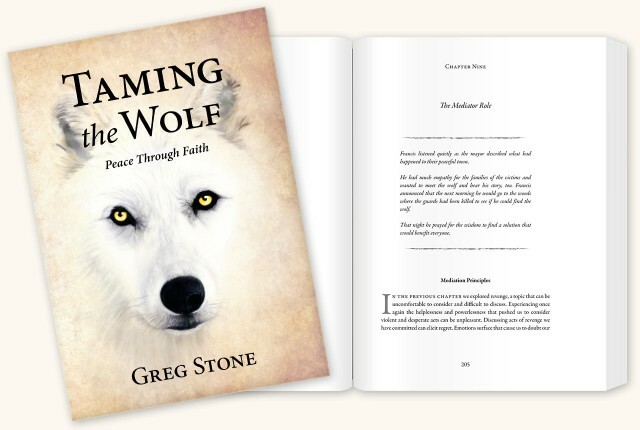 Buy Taming the Wolf: Peace through Faith today. Learn to make peace in your life. Unresolved conflict persists when opposing parties become locked in battle. Conflict resembles a runaway train: parties hurtle down the tracks toward disaster with Fate at the controls. Taming the Wolf: Peace through Faith guides readers through the conflict resolution process with practical lessons that address difficult situations that crush our happiness. Taking a faith-based approach, it offers tools and techniques that will help ordinary people become not just mediators, but Franciscan peacemakers. In order to avoid the ruinous consequences of unresolved conflict, something has to change—transformation must occur. Taming the Wolf guides the reader through transformations that lead to reconciliation. Taming the Wolf provides the road map for change when conflict escalates. It brings the power of faith to the peacemaking process with emphasis on spiritual transformation. Who should read Taming the Wolf? No one lives their life or even a day without encountering differences with others. Conflicting interests, views, needs, activities, positions, and identities must be reconciled if we hope to maintain harmonious relationships. Taming the Wolf guides the reader through the mediation process from pre-convening to reconciliation. The reader becomes familiar with options they may select. Self‐assessment prompts guide the reader through preparation, helping then make informed decisions and choices. the role of the Divine in conflict resolution and reconciliation. Excerpts from the legend inspire contemplation, as the story transports readers to heights where logic and rules fail. The excerpts motivate readers to enter a period of silent contemplation. Mediation principles provide a foundation in the theory and practice of mediation. This section prepares readers for an active and informed role in mediation, providing the knowledge and skills that make success possible. The Franciscan View and Scripture soften previously hardened hearts. Logic, reason, and argument that may have previously dominated their thoughts are set aside as a more transcendent frame is considered. The reader’s intuition is fired, delivering new and unexpected insights. Most people desire peace. They do not relish conflict with marriage or business partners, with employers or employees, or with their government. When conflict with other nations or peoples exacts terrible personal and collective costs they suffer sadness. Yet conflict seems inevitable. The desire to live a peaceful life appears insufficient by itself. A desire for peace does not guarantee peace. Instead, conflict management skills found in Taming the Wolf: Peace through Faith are required. Mediation and increased spiritual awareness are needed to overcome conflict.